I had the honor of chatting with Christel Schmidt, editor of and contributor to Mary Pickford: Queen of the Movies, when she came to Seattle recently to present a screening of Sparrows at the SIFF Film Center. She dished with me about Mary, and her new book, over breakfast. It was a fascinating morning, and I learned so much. Here are some highlights of our conversation. 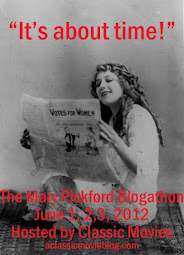 I have a lot of people say to me, how can you do a book on Mary Pickford and not retread? And we did retread. You have to, because you have to understand that some of your audience has not read Eileen [Whitfield's Pickford biography] or read Kevin [Brownlow's career review] book. But I knew there were so many details that you couldn't flesh out in a biography. For example, you couldn't do an in-depth chapter about what Pickford did for the Liberty Loan or the social history of hair and how Mary's hair affected her career. When I was doing research, I was trying to look for any memorabilia I could find from Pickford's theatrical career as Gladys Smith. We knew she had been in Philly, so we called the Philadelphia Public Library, because they have a very large theater collection. I asked if they had any programs, because it would be nice to have at least one. And the woman says "no, but I pulled the Mary Pickford file, and you're not going to believe this, we have a bag of her hair." So she sends me this photo, and literally, it's a bag of her hair….What we determined was that someone was going to make a Mary Pickford doll, because it came with a list of things like her shoe size and her eye color, how tall she was, all this physical description, and they think they were trying to match the hair. So Mary sent them a bag of hair. I thought well, if you're going to have a bag of someone's hair, it would be her. People are so critical of Mary's decisions. There's not a lot of sympathy or empathy about some of the things she went through. Like, oh she wouldn't update. But this was a difficult decision. The country was divided and women were divided. The 1920s was the beginning of the culture wars and youth culture as we know it. Pickford and Swanson were about ten years past the prime age to catch that wave. She was up against a lot. The fact that she kept her fame as strong as it was in the 20s speaks a lot to what she was doing. Pickford wasn't a little girl who clapped her hands and cried on cue and whose problems were insignificant. The fact is, she had edge, she was a new woman in many ways, she was modern. She looked like a Victorian angel, but she was a modern woman. I think she should have made Night of the Hunter. Lillian Gish is playing Mary Pickford. A story about good and evil, a story about a woman protecting children against an evil man. Charles Laughton said that Sparrows influenced that film. I think that influence very obvious when you see it. And that is not who Gish was. That was Pickford's persona. I don't even think she was asked. There was also [the audition for] Life with Father, there was discussion of her being in Storm Center, and of course Sunset Boulevard. That would have been a very different kind of film with Mary Pickford. I think that when you lose the people most important to you in a ten year span and the only thing you've ever known, your work, the thing that soothed you, made you, and has been a creative outlet since you were eight years old, it's tough. You lose your mother, the love of your life, your brother and sister. It's just too much. The press turned on her…. there's a lot of really misogynistic things about her business sense. And you know, comparing her unfavorably to Sylvia Ashley [the woman Fairbanks married after Pickford] and things like that were quite cruel. I think she was a very strong woman, but everyone has a breaking point, and alcoholism was a family curse. She had so much responsibility. No one ever went so high and no one ever fell so low. I can't imagine how incredibly painful that is. You've had a lot of people who have written, especially at the end of her career, that she'd always played a child. The woman made over two hundred films. She played a lot of roles. Her signature character is really a young woman, someone coming of age. Dorothy Vernon of Haddon Hall--that's the film where everyone says, well she tried to grow up. Dorothy Vernon is turning 18 years old in that movie. That is the typical age of a Pickford character. She comes from a long line of feisty, strong, heroic Pickford characters. What she was trying to do was to have some adult sophistication. The character of Stella Maris is what people think Pickford films were about. They weren't. There was a harsh side of life. Many of her characters dealt with physical abuse, alcoholic parents, poverty. More of her films see life through Unity Blake's eyes, a character who's seen a tough life. She didn't play privileged very often. She played a working class heroine who was fighting for something. These things are not about heterosexual romance, which drives the narrative of almost every movie you see. In an era where everything is so sexualized, it's really great to see this female character who has other things to do. I was a women's studies major at Ohio State and I had a very well-known professor tell me that Pickford was a shrewd businesswoman, she was not a talented actress and she made her career basically playing children. And I read what a lot of the feminist writers wrote and I had very negative ideas. Then I went to the George Eastman House for a certificate in film preservation, and they had a lot of her films. I sat down with them, and I was blown away, because she was not what I thought she was going to be. Archives weren't as accessible then as they are now, so people weren't seeing her films. They relied on what they saw in magazines to form their opinions. I think in some ways people felt she betrayed her gender, when really, it's the opposite. She ended up on the wrong side of the culture war. It's that all the cool kids decided that she wasn't cool. All the people who flock to the Louise Brooks' and Clara Bows', they dismiss her. And it's their loss, because she was very much the new woman and she's as great a role model today for women as she was then. Not that long ago, the Sunday movie on TCM was The Hoodlum. I stayed up until 3 in the morning to live tweet it. At the end, Ben Mankiewicz said, essentially, that Pickford made a career out of playing needy women who needed the help of a man. I tweeted back to him that that is absolutely 100% wrong. The thing is, if TCM can't get it right, we're in trouble. She did child roles, and people thought they were amazing because of the way she performed them. And these were for the most part from famous, successful books that had also been stage plays performed by women. They weren't written for children, but for a larger audience, which included women. It's just that people misremember. It's almost at the point where they are being willful about it. Because it's not that difficult to see a lot of the films now. Coming up tomorrow in Part II: Did Pickford ever really mean to have her films burned upon her death? Also, her marriages with Buddy Rogers and Douglas Fairbanks, and her reputation today. Thank you for writing this post.. I have this book and it is beautiful.. I'm glad you enjoyed it Dawn. It's amazing to me the things that didn't make it into the book. Pickford is endlessly fascinating.